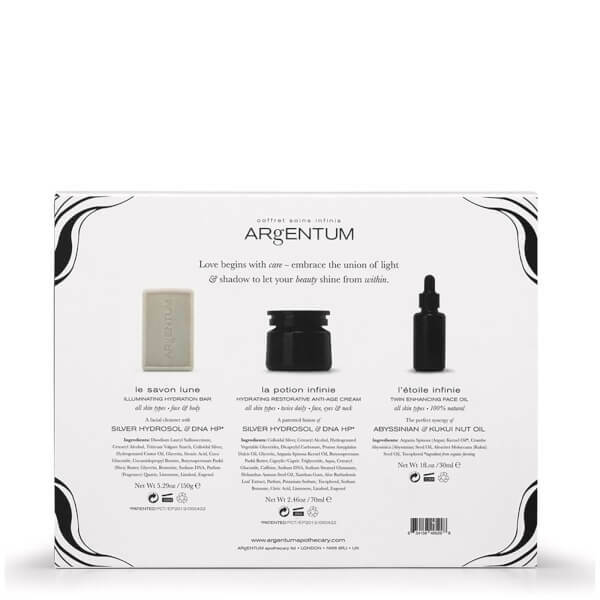 The coffret soins infinis is ARgENTUM’s all-encompassing trio for your skin. 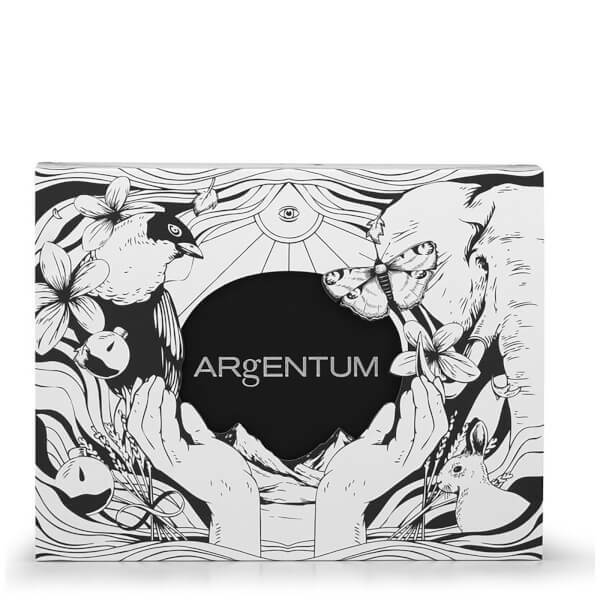 This true gift of beauty is presented in a luxurious gift box wrapped in illustrations by Joe Wilson and handcrafted in the UK. 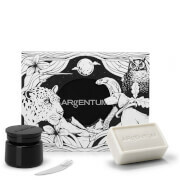 Lift the lid to experience le savon lune, a truly unique facial cleansing bar that contains powerful antibacterial and anti-inflammatory properties to leave your face perfectly clean and hydrated. 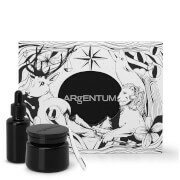 Starring la potion infinie, a super-hydrating restorative day & night cream that contains the award-winning patented formula of Silver Hydrosol & DNA HP. Enhance with l’étoile infinie, an elixir designed to be used as a light, protective, hydrating oil, or as the twin star working to nourish your skin and balance natural oil production whilst helping to unify your complexion. 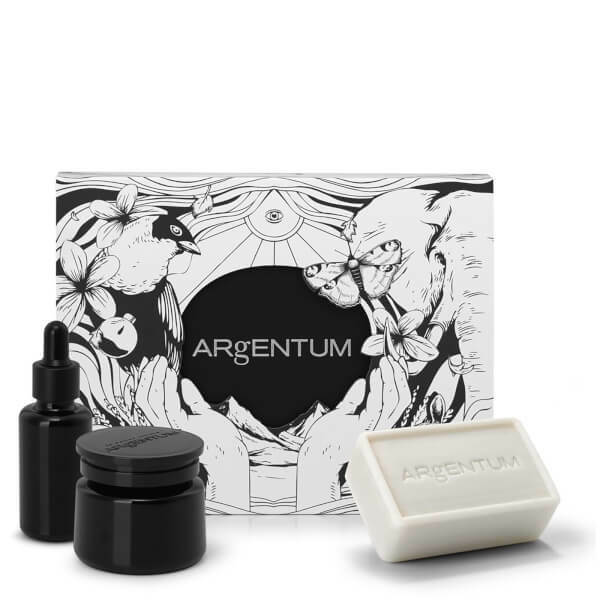 Before applying la potion infinie, cleanse your skin with le savon lune, our facial cleansing bar, and rinse thoroughly by splashing your face several times with warm running water. This increases micro-circulation and relaxes your skin in preparation for the powerful active ingredients Silver Hydrosol & DNA HP. 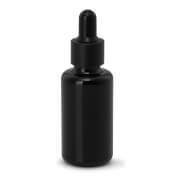 Gently massage la potion infinie into your face, neck and around the eye area. After allowing the patented active ingredients to penetrate the intercellular space of your skin, warm a drop of l’étoile infinie in the palm of your hand and gently apply to the contours of your bone structure, patting or massaging in circular motions. Alternatively, combine a drop with your application of la potion infinie to leave a luxurious, cushioning feeling to your skin. le savon: Disodium Lauryl Sulfosuccinate, Cetearyl Alcohol, Triticum Vulgare Starch, Colloidal Silver, Hydrogenated Castor Oil, Glycerin, Stearic Acid, Coco Glucoside, Cocamidopropyl Betaine, Butyrospermum Parkii (Shea) Butter, Glycerin, Bentonite, Sodium DNA, Parfum (Fragrance) Quartz, Limonene, Linalool, Eugenol.